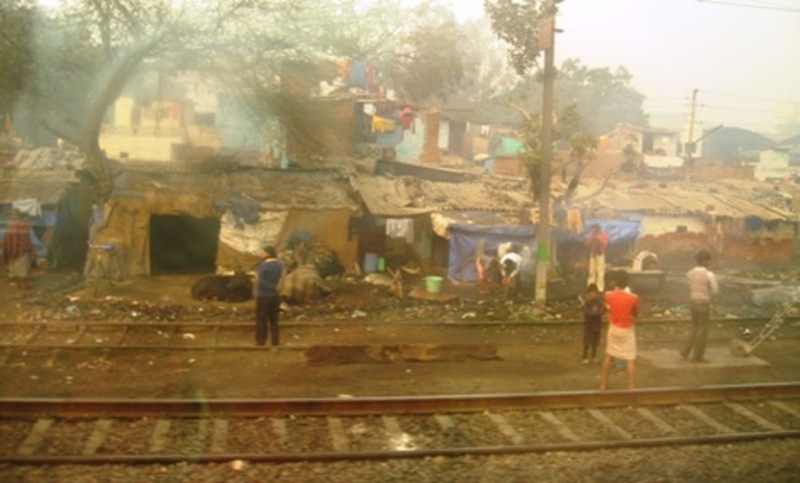 Slums are widespread in India's rural towns. Photo by Melanie Goldberg. I never understood the extent of the Bethesda bubble until I went to India. The Bethesda bubble is a curious phenomenon in which, despite proximity to the nation’s capital, the influence of mass media and an excellent educational system, many people in the Whitman area are woefully unaware of international affairs. On a train ride from Delhi to Agra (where the Taj Mahal is located), I sat in a first class car. I had a comfortable seat, next to a large, curved glass window that gave me an unobstructed view of the passing countryside. I was served tea and a complimentary warm breakfast. But not all the cars offered the same pleasant experience. The car behind me had no windows. The car behind that had no seats. And they were the lucky few who could afford a train ticket. The poverty that we witnessed was astonishing. Families were living in shanties no bigger than a closet, constructed haphazardly out of blankets, scrap metal and brick. Children with polio were crawling in the street, their useless leg swinging sickly behind them. People were drinking and bathing in green, stagnant water. There are not many trash cans, so garbage piles up in every conceivable place. There are also no bathrooms in the slums, so scores of men and women come to the barren train tracks to relieve themselves. In the rural areas, huts are constructed out of stacked cow pies that disintegrate during monsoon season. Over this four-hour journey, my glass window became my bubble. It was a shield, protecting me from the filth and disease, but also was a barrier, separating me from reaching out to the impoverished. Many people in the Whitman community can hardly be bothered to even think about the squalor that is the everyday reality for millions. Perhaps if we pop the bubble, we will see the true cost of our apathy.